The goal of this challenge is to find the direction and area enclosed by a loop. The left grid is the sample input; the right grid is the loop isolated. The input grid will contain either no loops at all or one loop; you do not have to worry about any cases in which the grid contains more than one loop. If the grid contains no loop, output X. If the grid contains two arrows pointing at each other, output 0. If the grid contains a counterclockwise loop, count the characters enclosed by the loop, including the border. Output that number. 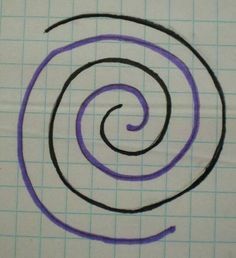 If the grid contains a clockwise loop, follow the same process for the counterclockwise loop, but output the negative of that number. For instance, the above input grid would have an output of -11: 10 come from the loop itself, and 1 from the character enclosed by the loop. This is code-golf. Shortest code wins. Complete program, accepts input (line-delimitated layout, no dimensions) from STDIN, outputs to STDOUT. The program works by first reading in the layout, needless to say, and then iterating over every cell. We then run a 'snake' from each cell, which follows the arrows until it runs off the edge, or runs into itself. If it runs into itself, then we know we have found a loop (or one of those "><" things), and it also knows how much of the snake is in the loop. Once we know we have a loop, we know which cells are on the loop, and we create a map from each cell (+1, for reasons) to either itself, -1 (means it's on the loop), or W (the whole width) if it's on the edge (or the +1 (which is at index W) to simplify things further one). While we do this, we also find the direction that the 'last' element of the loop has (that is, the last element of the loop on the last row that has elements from the loop on it). This element must be a "<" or an "^", and this tells us the clockness (CW/CCW) of the loop (translated to -1/+1). We then perform a disjoin set pass, which assigns all the elements that are outside the loop to the W set. We then subtract how many of these there are from W to get the number contained on and in the loop. If this number is less than 3, we replace it with 0. We multiply this by the clockness, set it as the result, and somehow escape from the for loops, where the result is output. If, however, most of the above never happens (because no snake ever finds itself), then the result remains as "X", and that is outputted.